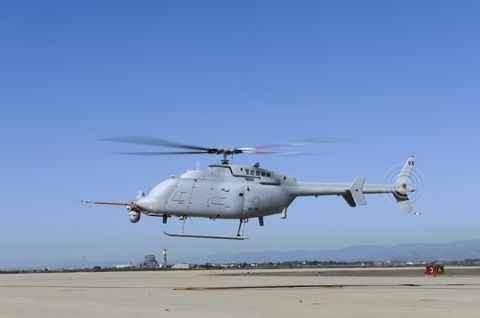 POINT MUGU, Calif. – Oct. 31, 2013 – Northrop Grumman Corporation (NYSE:NOC) and the U.S. Navy successfully completed the first flight of the next-generation MQ-8C Fire Scout unmanned helicopter at Naval Base Ventura County, Point Mugu, Calif.
At 12:05 p.m. the MQ-8C Fire Scout took off and flew for seven minutes in restricted airspace to validate the autonomous control systems. A second flight that took off at 2:39 p.m. for nine minutes was also flown in a pattern around the airfield, reaching 500 feet altitude. The aircraft was operated by a ground-based Navy/Northrop Grumman flight test team also located at Naval Base Ventura County. 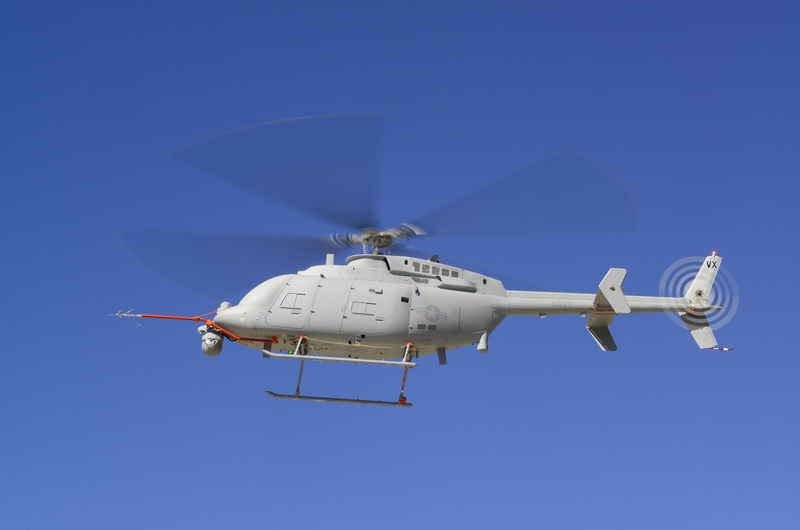 "First flight is a critical step in maturing the MQ-8C Fire Scout endurance upgrade before using the system operationally next year," said Capt. Patrick Smith, Fire Scout program manager, Naval Air Systems Command. "The systems we've developed to allow Fire Scout to operate from an air-capable ship have already amassed more than 10,000 flight hours with the MQ-8B variant. This system's evolution enhances how unmanned air systems will support maritime commanders." The MQ-8C Fire Scout is designed to fly twice as long and has three times the payload capacity of the current MQ-8B variant. Based on a larger commercial airframe with additional fuel tanks and an upgraded engine, the MQ-8C will be able to fly up to 12 hours or carry up to 2,600 pounds. "Operating the MQ-8B Fire Scout from Navy ships has proved extremely successful. During at-sea deployments, operators saw the need for a system that carried the same intelligence-gathering capabilities of the MQ-8B, but fly longer and carry additional payloads," said George Vardoulakis, Northrop Grumman's vice president for medium range tactical systems. "Changing out the airframe, installing control systems and avionics, and then conducting a first flight of the system in a year is truly remarkable. I couldn't be more proud of the team." Currently, the MQ-8B Fire Scout is on its seventh at-sea deployment supporting antipiracy missions on board Navy frigates. The system has also been used extensively in Afghanistan since early 2011 to provide airborne surveillance to ground commanders. Using on-board sensors to capture full-motion video, Fire Scout can identify targets and then distribute the information in real time to various users. This capability allows ship-based commanders to maintain awareness of a specified area or keep an eye on a target of interest for long periods of time. Production of the MQ-8C Fire Scout is being completed at the Northrop Grumman Unmanned Systems Center in Moss Point, Miss. The MQ-8C Fire Scout industry team includes Bell Helicopter, Rolls-Royce, Summit Aviation, Cubic Corporation, General Electric Aviation, Sierra Nevada Corporation and Honeywell.